As mentioned above, oceanic N2O is exclusively produced by biological processes, thus, its production is indirectly linked to the biological productivity of the coastal and open oceans (Figure 3.8). This, in turn, implies that we have to understand how eutrophication of the coastal areas and fertilization of the open ocean influences the productivity and the resulting O2 depletion during the remineralization (oxidation) of organic material. 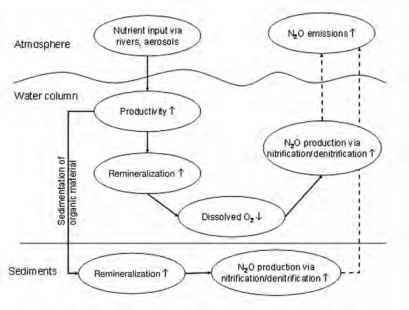 Both nitrification and denitrification are involved in the remineralization process and the N2O yield of both processes depends on the prevailing O2 concentrations (see above). 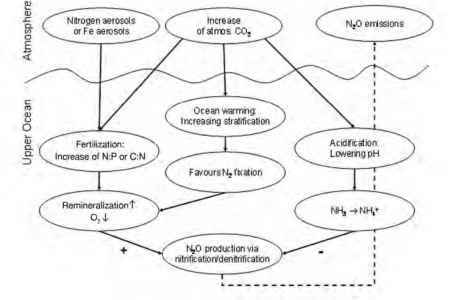 Figure 3.8 Simplified scheme of processes leading to enhanced N2O formation in coastal areas. Note: Up and down arrows within the ovals stand for increase or decrease, respectively. On the basis of N2O measurements on the shelf of the west coast of India, Naqvi et al (2000) cautioned that the N2O emissions from shallow sub-oxic/anoxic coastal systems might increase in the future, due to the fact that the number of coastal regions with severely depleted dissolved oxygen concentrations is currently increasing worldwide (UNEP, 2004; Diaz and Rosenberg, 2008). 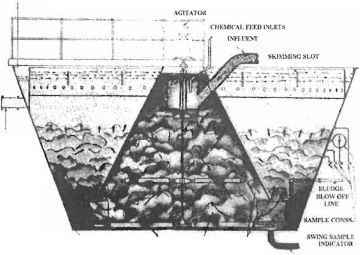 Eutrophication can also significantly stimulate sedimentary N2O formation by denitrification, which was demonstrated by Seitzinger and Nixon (1985) in microcosm experiments. This is in line with observations that N2O release from mangrove ecosystems appear to be very sensitive to eutro-phication: N2O release across the mangrove sediment/atmosphere interface can be enhanced up to 2800 times when adding NH4+ and/or NO3- (Bauza et al, 2002; Muñoz-Hincapié et al, 2002; Kreuzwieser et al, 2003). Therefore, it seems realistic to expect that the N2O emissions from shallow sub-oxic/anoxic coastal systems (including mangrove ecosystems) will increase in the near future due to increasing nutrient inputs caused by the ongoing industrialization and intensification of agricultural activities. Only recently, Stramma et al (2008) showed that the oxygen minimum zones of the intermediate layers (300 to 700m water depth) in various regions of the ocean are expanding and have been losing oxygen with rates ranging from 0.09 ± 0.21pmol kg-1 yr-1 (in the eastern equatorial Indian Ocean) up to 0.34 ± 0.13pmol kg-1 yr-1 (in the eastern tropical Atlantic Ocean) during the last 50 years. In order to assess the maximum associated N2O formation, we may roughly estimate the additional long-term N2O formation in the tropical Atlantic Ocean: assuming a mean AN2O/AOU ratio of 10-4 (Walter et al, 2006a) we compute an additional N2O concentration of 1.7nmol kg-1. This translates into a contribution of 6 per cent of the actual mean N2O background concentration of about 30nmol kg-1 at 500m depth in the tropical North Atlantic Ocean (Walter et al, 2006a). However, an N2O accumulation at intermediate water depths in the open ocean will not lead to an immediate release of N2O to the atmosphere because these waters are not in direct contact with the atmosphere. A major fraction of the accumulated N2O will be subsequently released to the atmosphere from other oceanic regions when the water masses are brought back to the ocean surface. A future increase in N2O emissions has been suggested as an indirect result of enhanced productivity via increases in nitrogen or iron (Fe) aerosol deposition (Fuhrman and Capone, 1991; Jin and Gruber, 2003; Duce et al, 2008), N2 fixation (Karl, 1999) and riverine nutrient inputs (Naqvi et al, 2000) (Figure 3.9). Figure 3.9 Simplified scheme of processes leading to future N2O formation and/or consumption. Note: Up and down arrows within the ovals stand for increase or decrease, respectively. The plus sign (+) stands for a potential enhancement of N2O production, whereas the minus sign (-) stands for a decrease in N2O production. cent increase in the oceanic N2O production because of decreasing O2 concentration in the open ocean is predicted (Schmittner et al, 2008). A more dramatic short-term expansion of the open ocean sub-oxic areas ([O2] <5pmol litre J) during the next 90 years was predicted with the same model when using unusually high C:N ratios (for the remineralized organic material) that were derived from mesocosm experiments simulating future high atmospheric CO2 concentrations (Oschlies et al, 2008). One would expect that this also changes the near-future N2O production and emissions, however, the effect of high C:N ratios on the N2O production was not investigated in the study by Oschlies et al (2008). Ocean acidification (Raven et al, 2005), caused by increasing atmospheric CO2 (CO2 + H2O ^ HCO3~ + H+), could lead to a counteracting effect because it shifts the oceanic NH3/NH4+ equilibrium towards NH4+ with consequences for AOB because they preferably take up NH3 and not NH4+ (Ward, 2008). Therefore, an overall decrease of the oceanic NH3 concentrations might lead to a decrease in nitrification (Huesemann et al, 2002) and has the potential to decrease N2O production via nitrification as well. (Wanninkhof, 2007) and wind-driven oceanic circulation/mixing processes (coastal upwelling, storm events). For example, Naik et al (2008) showed that a storm can deepen the mixed layer considerably, thereby entraining N2O from the subsurface maximum to the surface layer, where it easily escapes to the atmosphere. Therefore, N2O emissions triggered by strong wind events may contribute significantly to both the regional and global oceanic N2O emissions (Patra et al, 2004; Bange et al, 2008). In view of the fact that the strongest tropical cyclones, especially in the northern Indian Ocean, have been increasing in intensity in recent years (Elsner et al, 2008), we might expect an increase of N2O emissions triggered by storm events. Therefore, any long-term changes of the atmospheric circulation that alter the wind fields with respect to the wind speeds and the wind field patterns might lead to changes in the N2O emissions.